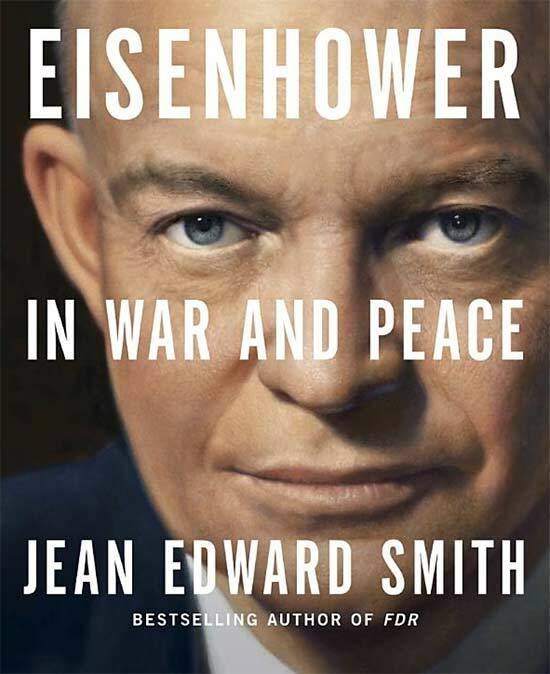 Just finished reading Jean Edward Smith's Eisenhower in War and Peace and I have to say that it was a fine enough book that I couldn't put it down. I've been on a World War II book reading binge these past few months and seeing that it had a good rating on Amazon I decided to pick it up. I surely wasn't disappointed, Mr. Smith's book is one of the most comprehensive articles written on President Eisenhower. This book is based on personal diaries, first hand interviews of those closely associated with President Eisenhower and recently unclassified documents. Just to show how timely the book is. It's quite a long book (766 pages) so be prepared to rest your eyes a lot. This narration of General Dwight D. Eisenhower's life starts from his birth till his death in March 28, 1969. It starts with his simple background and how he ended up in the military. How he was able to get on the fast track and get noticed by the powers-that-be thanks to the help of his friend, George Patton (yes the General Patton) who introduced him to General Fox Conner. General Fox Conner is known as the man who mentored the young Eisenhower and saw the potential in the young man to be a good leader that he helped his career along the way whenever he was in a bind. Then to how he became General Douglas MacArthur's deputy and to how he came to abhor him. On to his administrative career during the build up of World War II and his assignment as Supreme Commander for the operation of the invasion of Europe. Speaking of General Patton, he was the one who coined Eisenhower's D.D. initials to stand for "Divine Destiny." Because of the man's luck and skill that he said made him destined for greater things. How prophetic indeed of General Patton. General Eisenhower wasn't even a better general compared to Gen. Patton and Gen. Montgomery. He was often criticized for not having any prior experience in leading men into battle when it was announced that he would be in charge of Operation Overlord. But it was his skill of being able to collect an international coalition of allied forces with different attitudes, egos and cultural background and to make them work together seamlessly that got him the job. General Eisenhower was no spring chicken, he knew the art of finesse and politics to get coalition leaders to see his way in order to accomplish the task at hand and he did not shy away from bypassing his own bosses if he knew that it was for the greater good of the endeavor. That unique gift of being able to get people to move the way you want them to move is known as charisma, and General Eisenhower overflowed with it. When he became president, it was shocking for me to find out how those around him could be so flippant in recommending the use of the atomic bomb to quickly settle international squabbles like it was just like chucking a hand grenade. Good thing President Eisenhower abhorred the use of nuclear weapons and preferred diplomacy and indirect tactics instead. It is his legacy of self control in finding a more peaceful or political resolution to any conflict rather than fall prey to the temptation of solving everything by means of the atomic bomb that we of the present day owe to this man. Could you just imagine?, if he had not set this precedent of nuclear restraint we would probably be living in a post apocalyptic world right now. I've been an admirer of General Eisenhower because of his exploits during World War II but after reading this book it made me admire him even more for what he has accomplished beyond his career in the military. A testament to that is the high approval rating that he had during his presidency. This book does not fluff up the life of President Eisenhower, in fact it exposes both the good (civil rights, Suez canal affair, National highway, etc) and the bad (Iran, Guatemala, etc)in the man. Like all men, General Eisenhower falls prey to human frailty but its his quality of unflinching justice for the greater good and infectious calm in the face of adversity that made him a good world leader.